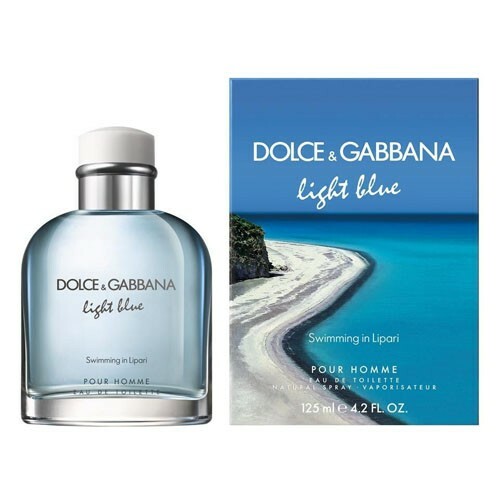 Dolce & Gabbana is launching new limited editions for Summer 2015 of their popular fragrances Light Blue from 2001 and Light Blue Pour Homme from 2007. The new releases are named Light Blue Sunset in Salina and Light Blue Pour Homme Swimming in Lipari. Light Blue Pour Homme Swimming and Lipari is an invigorating aquatic scent inspired by Mediterranean waters. It opens with accords of sea salt enhanced by the freshness of grapefruit. The heart combines mandarin and cool, aromatic rosemary. Ambergris, dry woods and musky notes end the composition. It is recommended for daytime wear.